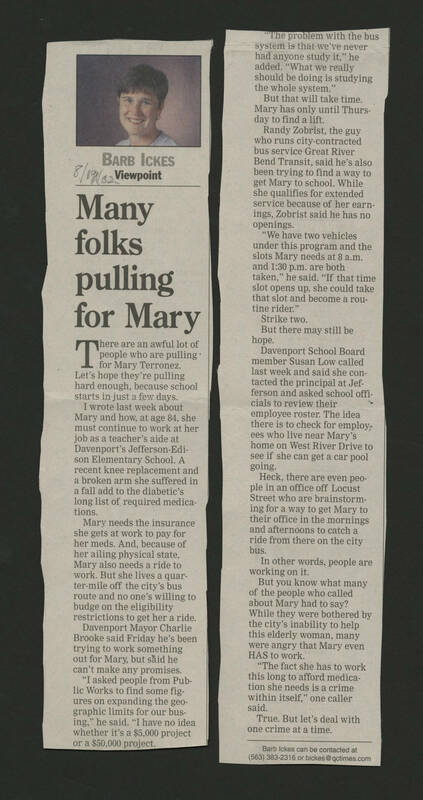 DIY History | Transcribe | Social Justice | Mary Terronez biographical files, 1962-2009 | 2002-08-19 Quad City Times Article: ""Many folks pulling for Mary""
2002-08-19 Quad City Times Article: ""Many folks pulling for Mary""
8/19/02 Barb Ickes Viewpoint Many folks pulling for Mary There are an awful lot of people who are pulling for Mary Terronez. Let's hope they're pulling hard enough, because school starts in just a few days. I wrote last week about Mary and how, at age 84, she must continue to work at her job as a teacher's aide at Davenport's Jefferson-Edison Elementary School. A recent knee replacement and a broken arm she suffered in a fall add to the diabetic's long list of required medications. Mary needs the insurance she gets at work to pay for her meds. And, because of her ailing physical state, Mary also needs a ride to work. But she lives a quarter-mile off the city's bus route and no one's willing to budge on the eligibility restrictions to get her a ride. Davenport Mayor Charlie Brooke said Friday he's been trying to work something out for Mary, bust said he can't make any promises. "I asked people from Public Works to find some figures on expanding the geographic limits for our busing," he said. "I have no idea whether it's a $5,000 project or a $50,000 project." "The problem with the bus system is that we've never had anyone study it," he added, "What we really should be doing is studying the whole system." But that will take time. Mary has only until Thursday to find a lift. Randy Zobrist, the guy who runs city-contracted bus service Great River Bend Transit, said he's also been trying to find a way to get Mary to school. While she qualifies for extended service because of her earnings, Zobrist said he had no openings. "We have two vehicles under this program and the slots Mary needs at 8 a.m. and 1:30 p.m. are both taken," he said. "If that time slot opens up, she could take that slot and become a routine rider. Strike two. But there may still be hope. Davenport School Board member Susan Low called last week and said she contacted the principal at Jefferson and asked school officials to review their employee roster. The idea there is to check for employees who live near Mary's home on West River Drive to see if she can get a car pool going. Heck, there are even people in an office off Locust Street who are brainstorming for a way to get Mary to their office in the mornings and afternoons to catch a ride from there on the city bus. In other words, people are working on it. But you know what many of the people who called about Mary had to say? While they were bothered by the city's inability to help this elderly woman, many were angry that Mary even HAS to work. "The fact she has to work this long to afford a medication she needs is a crime within itself," one caller said. True. But let's deal with one crime at a time.